Speaking from his plush yacht in the Far East Ocean, Vincent Tan appeared his usual eccentric self. Wearing his trusty red shirt did little to change this feeling (does he wear anything else?) as he laughed like Mr Chow (Hangover film) to Sky Sports’ Jim White. However what he said regarding Solskjaer’s conduct on departing Cardiff was very accurate in that the Norwegians’ quote that the pair had a ‘’difference in philosophy’’ was absurd. Tan went on to state that the only difference they had was that he wanted a winning team. Another part of the Tycoon’s interview that he was correct in was his assessment of his financial backing. They might not be the right manager but he certainly supports them in the pursuit of any transfer targets they desire. What left me flummoxed however, was his statement that Russell Slade was his choice of manager and I was even more perplexed to see him flippantly claim that he will buy another UK club on selling Cardiff. Well nothing really surprises me with Tan or Cardiff anymore. The sooner he exits the club, the better. Onto footballing matters and the midweek jaunt to Brighton was frankly not worth the hassle. The Bluebirds laboured through an arduous contest whereby David Marshall was called on more than once to make an outstanding save. If it wasn’t for the Scotland stopper they would have trailed. To hear Scott Young say that ‘’the players were tired’’ at Brighton left me thinking ‘’really?’’. How can the Championships richest and most complete squad be tired? And why are they not bringing in Adam Le Fondre or Kagisho Dikgacoi? For the record the slight upturn in effort has been visible from the minute Young and Gabbidon took charge and they should be commended on this. The way the pair have worked implicitly with Russell Slade’s input hasn’t been good considering the instability of the situation. For the time being the likelihood of Young partnering Slade in the dugout is looking a risky partnership. A Port Talbot based Bluebird myself, I have followed Young’s time at the Welsh League side and was disappointed to see him relieved of his duties. Failing to make the top six was his downfall and Chief executive Andrew Edwards added “This decision was not taken lightly, but the board feel it is in the best interests of the club moving forwards, “The board would like to place on record their thanks to Scott for his efforts this season and wish him every success in the future.” He won’t be the first person to get it wrong at the first attempt though and it may prove the making of him in the long term. My own verdict on Gabbidon and Young is that neither are capable of managing a club for quite some time. Blackpool were put on a pedestal by the pair as a team to be wary of. No team is easy in the Championship but should we not be focusing on our own strengths and making Blackpool fear the team which was unanimously deemed the best in the league at the start of the campaign. Unsurprisingly the double act stated that the Bluebirds can still be promoted after the match. This is nothing more than a cry for a permanent post at the club in my eyes and begs of desperation. Mathematically they can still get promoted and a run of wins can change everything. To do so is looking an uphill battle on current form and avoiding relegation is looking a more realistic goal. You could be forgiven for thinking that Cardiff City had arrived at Bloomfield Road off the waltzers at Blackpool’s pleasure beach. Such was the ineptitude of the first half display. Ismael Miller nearly latched onto a Zoko cross with the home team looking lively in an offensive sense. Cardiff meanwhile showed glimpses of class through Ravel Morrison alone. The problem was that nobody was on the same wavelength and the pattern of play was like watching a game of chess. Cardiff took a couple of moves forward and then retreated due to the pressing of a team that you wouldn’t believe had not won all season. Jose Riga is definitely Blackpool’s special one and how Cardiff could do with somebody who utilises a team of inferior quality. Blackpool’s goal came in the second half after good work down the left hand side by Gio. He found Francois Zoko and he burst into the Cardiff penalty area, and with Sean Morrison backing off, he slotted past the helpless Marshall. I would drop the former Reading man and replace him with the more comfortable Juan Cala. It is just regretful that Ben Turner isn’t fit because he is probably the best defender at the club. I say this as a person who hasn’t always favoured the Midlander’s inclusion in the first team. Even the most ardent Cardiff City fan could defend the player’s application at Bloomfield Road. The midfield of Ralls, Gunnarsson, Whittingham and Pilkington were unable to effect proceedings. We witnessed Gunnarsson playing careless passes to Orange jersey’s, Whittingham playing some delightful crosses but doing little else and Pilkington making some mazy runs and then wilting along with the rest of the team. On loan midfielder Ravel Morrison was gliding past markers and showing all the flicks and tricks that saw him labelled one of Sir Alex Fergusons most promising youngsters in Manchester. So when he was substituted, so was my hope in Cardiff getting back into the match. I was also a little disappointed to see Kenwyne Jones leave the field, more due to the misfiring of Macheda and Le Fondre than anything else. 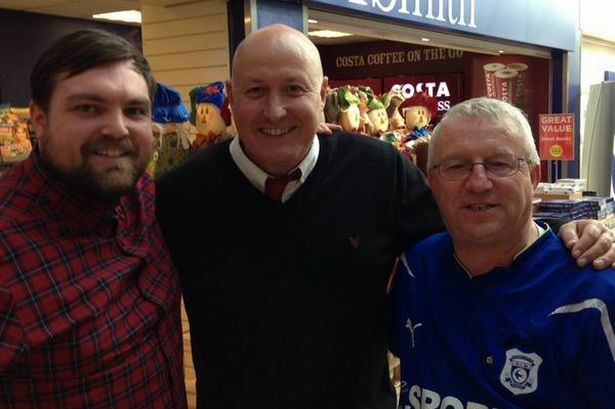 Well now that Russell Slade has been presented as Manager, things will get better at Cardiff City. They are quite simply a shambles on the field and off it. We know that the kit fiasco is the elephant in the stadium and this will always hold Cardiff back from reaching their full potential. It has been done to death so I won’t expand too much on this topic. What I will say though, is that a united fan base is what Cardiff need. Not since Malky Mackay’s sacking has there been anywhere like the distain that accompanies a Cardiff match. The Scot made major mistakes in his racism misgivings and has paid the price for such actions. Despite this I still maintain that he was an excellent manager for Cardiff and every player and fan was singing from the same hymn sheet. From his early interviews, I trust Russell Slade to put some pride back in Cardiff in the same way Malky did when he first arrived. My previous article ”Slade To Stop Slippery Slope” was indicative of the impact he can have at teams and what a pleasant man he appears. He has chatted to fans in the services and looks to be embracing Cardiff City life. On the pitch I would drop Whittingham, Gunnarsson, Ralls and Morrison and my starting line up would be set up with Kenwyne Jones upfront and either of Guerra or Le Fondre alongside him. If you like I think that they should encorporate a formation similar to the Bothroyd and Chopra partnership. To do this the latter would have to be energetic and stretch defences. They would need to drop into the midfield at times and match up against the five man midfield that so many adopt. Cardiff don’t have midfielders to dictate play even when they have five in midfield, from what I have seen anyway. Morrison should be positioned a bit further back and be allowed to get on the ball and supply passes to the forwards. Adeyemi will hopefully improve and can play alongside him, however I would also like to see Dikagcoi here if he is fit. My unusual choice of a midfield partner for Morrison is Burgstaller. He is strong, fast and I think he could provide the engine and combativeness that Cardiff have missed in Mutch’s absence. If a five man midfield is the order of the day, then it should include Morrison, Adeyemi and Kim for me. Alternately it could include Morrison, Adeyemi/Burgstaller and Daehli. What matters is that there are people in the midfield that are comfortable in possession and can received the ball in tight areas. Kim and Daehli are both very tidy on the ball and both can be easy to knock off the ball. I believe that Kim will prove his doubters wrong and have a resurgence to form. An uplift of this kind would see Russell Slade and Cardiff fans alike, bowing for a player that can be a magician in full pomp. These two line up’s offer diversity and the ability to swap and change, dependant on whether we are playing away, home or against weaker or stronger opposition. Stifling the opposition in the process but only tweaking things so the applecart isn’t upset. One thing is for sure, things can’t get any worse than this, surely?